Organisations rise or fall on their ability to successfully implement great ideas through strategic initiatives. At a time when leaders are expected to do nothing less than transform their organisations so they can survive and prosper in a hyper-connected, fast-changing world, they urgently need to know how to turn ideas into reality. The Brightline Initiative has developed a set of guiding principles to help leaders – and their organisations – build on their implementation capabilities. Brightline is a not-for-profit coalition, led by the Project Management Institute together with leading global organisations, that is dedicated to helping executives bridge the costly and unproductive gap between strategy design and delivery. Through our holistic knowledge and networking platform, we deliver solutions and insights that enable organisations to effectively deliver on their strategic initiatives. Brightline provides organisations with three key benefits that will improve their ability to deliver on strategic intent: thought and practice leadership, networking, and capability building. By providing cutting-edge research, promoting strategic change and facilitating global collaboration, we are giving business leaders the tools to transform ideas into results. Having a good idea is not enough to get results. There is a long and complex journey between having a good idea, or designing a strategic plan, and actually delivering it. Most strategic initiatives fail because of flawed implementation – not bad ideas – resulting in a waste of both time and money. The dynamic interplay between strategy design and delivery starts at the moment an organisation defines its strategic goals and investments. Most leaders appear to understand the importance of implementation and acknowledge the need to upgrade their delivery capabilities; at least 59 percent of respondents to Brightline’s global survey, conducted by the Economist Intelligence Unit (EIU), acknowledged a gap between their strategy design and implementation, and recognised its negative impact on organisational effectiveness. That’s barely an improvement on the 2013 EIU survey, which saw 61 percent of respondents admit to performance-sapping shortfalls in implementation. There is, however, no single true path to implementation excellence. As there are several frameworks for strategy design and implementation, every organisation needs to craft its own recipe for strategic success. We believe this recipe will be more effective when it adheres to Brightline’s Guiding Principles. To turn great strategies into stellar results, every organisation needs to have the right resources and talent in place. Brightline’s third Guiding Principle is about having the right talent to lead and deliver the strategic initiatives. Getting things done is hard and difficult work. It requires constant communication, focus, transparency, honesty, feedback and much more. But fundamentally, it is about people – bringing the best possible people to the task and maintaining their motivation and enthusiasm. This is something many organisations struggle with. Our research report showed that, within the group of leading organisations, those involved in strategy development were actively involved and collaborating with those responsible for implementation. The C-level and senior executives are the ones responsible for engaging line and functional managers, ensuring they clearly understand the strategy, its goals and the challenges the organisation needs to overcome to successfully deliver results. Securing a clear understanding of the strategy and buy-in is much easier when both ‘developers’ and ‘implementers’ work collaboratively. When there is no buy-in or alignment with line and functional managers, however, companies end up with a ‘frozen middle’. In Brightline’s sixth Guiding Principle, we state that leaders should “gain genuine buy-in from middle and line managers by engaging and activating them as strategy champions rather than just as managers and supervisors”. The EIU survey provides at least two key practices organisations can adopt to avoid the frozen middle. First, you must consider strategy delivery and design as an interconnected continuum of activities, not distinct areas of disparate importance. It does not work if one team creates a plan and another implements it. Second, it is important to have cross, multi-level communication and information flows across different levels of the organisation, as well as among the same levels (both cross-functional and cross-business). It is essential businesses do not forget to look externally for assistance: they must continue to monitor customer needs, collect competitor insight and monitor the market landscape for major risks, unknowns and dependencies. An app created by a group of students over a weekend can disrupt your business model in a matter of months and pave the way for a new set of products and services. Organisations need, therefore, to be able to identify trends, threats and opportunities, adapt their strategies quickly, and deliver results in the next quarter. 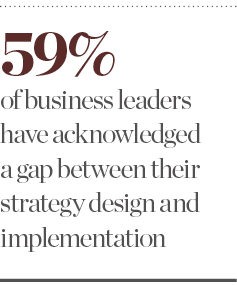 Most companies used to have five-year strategic plans. Now, plans are revised, updated or even discarded in some conditions at least twice a year. Data from the EIU survey showed that organisations with effective “feedback loops” presented advantages in resource allocation, strategic outcomes and overall performance. These leading organisations often show three key agile characteristics: they are faster to reallocate funding among implementation initiatives, quicker to reallocate personnel, and rapidly adjust strategies when new risks or opportunities emerge. Advantages in the market flow to those who excel at gaining new insights from an ever-changing business environment and who quickly respond with the right decisions and adjustments to both strategy design and delivery. 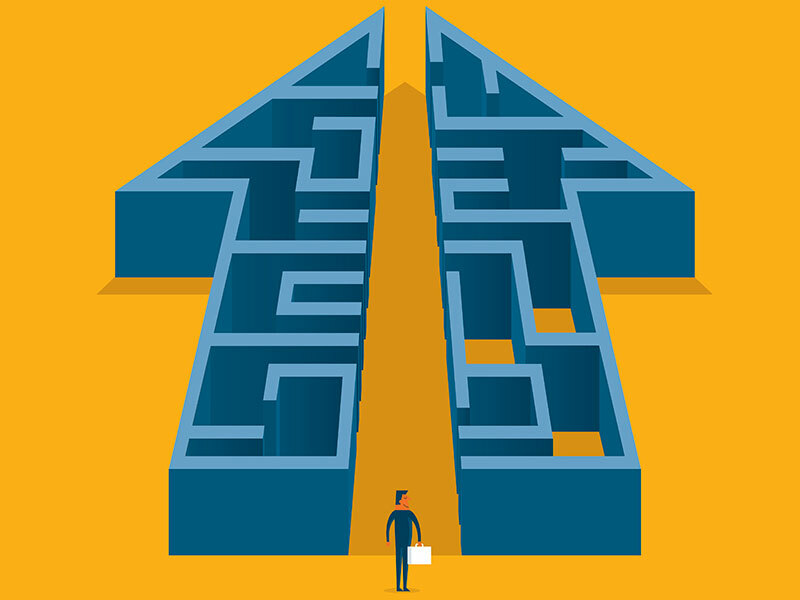 There is no one-size-fits-all approach to delivering a strategic initiative effectively. Businesses must select the relevant approach for each and every project or programme they are working on. Finally, Brightline’s 10th Guiding Principle is about recognition. Inspiring people is part of the job of any leader. As a leader, you have to drive accountability and focus on delivery, but also need to motivate those who do the work. Leaders must actively shape a winning culture by engaging and exciting the people responsible for delivering strategic change programmes. In other words, they must celebrate successes and quick wins, generously and publicly acknowledging those who demonstrate the leadership behaviours and programme-delivery capabilities that help the organisation transform strategies into great results.